The frost is now here! Temperatures are now regularly below freezing (and staying there). To avoid frost damage there are a few hints & tips for you; especially for those of you with unattended properties. 1 Get your plumbing system drained. This includes taps, water cylinders, lowering of shower heads & flushing of toilets. Turn the stop valve off as far back as possible & ensure it's properly covered. 2 Leave your heating system on frost protection mode. This should prevent the property dipping below 5°C. If you don't have a room thermostat then contact me for a quote. Wireless, programmable thermostat will save you money & will assist you in protecting your property. Most insurance policies dictate that your property is left at a minimum temperature if not's occupied. 3 Set thermostatic radiator valves to 'low' or even 'frost' setting. This ensures that the overheating of rooms doesn't occur when the boiler does fire. 4 Have some anti-freeze installed into the system. This normally involves draining of the system & the adding of anti-freeze. Normally we install around 20 litres for the average system. DO NOT use car anti-freeze - it's not the same thing! 5 Get your pipes lagged! Lagging of pipes cannot guarantee no damage, but it does slow down the heat loss process & may prevent damage (as well as save you money on normal heat loss). 6 Finally - and probably most importantly, get your property checked! A quick, half hour check to check the property is always a good idea. Again, if your house is unattended & you want a check please e-mail me.. 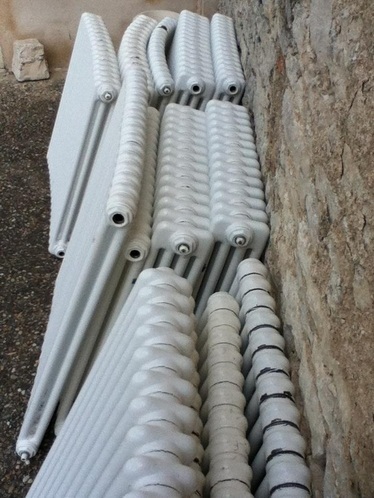 Since the frost this February (2012) I have replaced in excess of 100 radiators (21 in one house alone) & over 10 boilers, all due to frost damage. Not all of the costs were covered by insurance as precautionary measures had not been put in place (such as anti-freezel, draining of the plumbing etc). 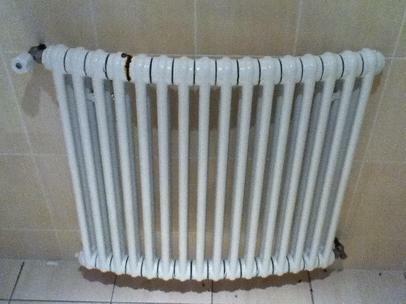 By the way, if you think the radiator above is pretty - it actually started off straight! That particular property ended up with over £20,000 worth of damage due to all the repairs that was needed. If you wish to contact me, please drop me an e-mail via the contact page or by phone 07864 997215.